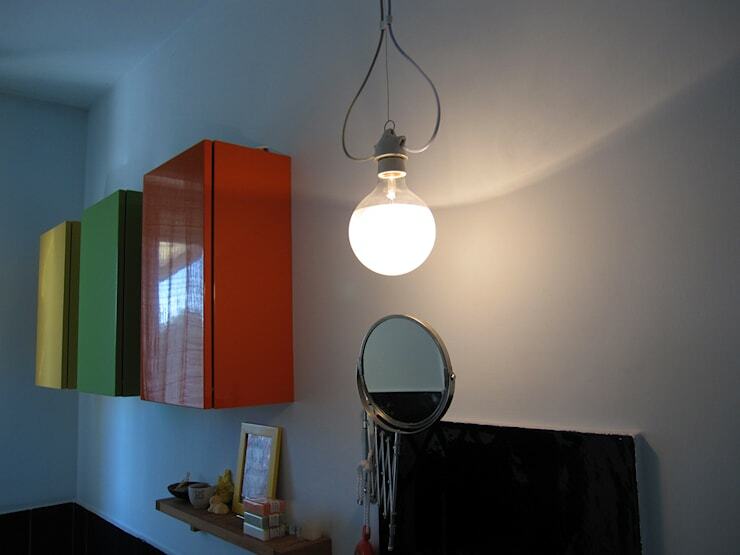 Bathroom lighting often has a tendency to lie towards the cold, sterile end of the spectrum. 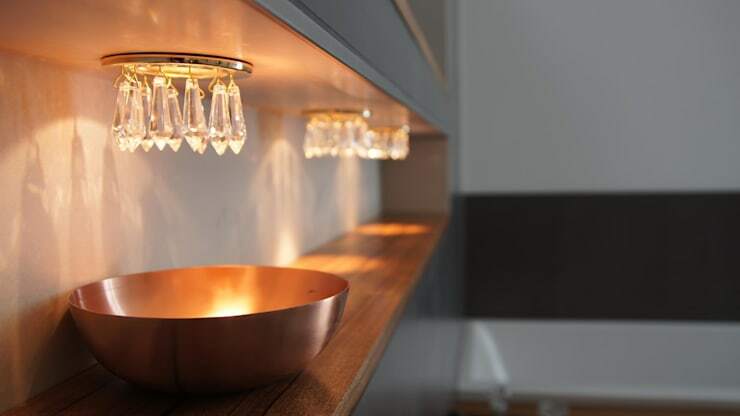 This is partly due to a traditional view—on the way out now, but still holding sway in some homes and minds—that soft lighting, or mood lighting, is something for other parts of the home. The fact that many bathrooms are white and bright in their colour scheme, perhaps combined with stronger lighting that that found in other rooms, can make the space feel ultra-clinical. Instead, surely the goal in designing a bathroom should be to make it one of the most relaxing spaces in the house? Yes, this is the place where mundanely routine tasks such as tooth brushing and face washing may take place, but it's also got another side to it. In most houses, the bathroom will be the only room with a lock; it's the one place where time alone is not only uncontroversial, but actually expected. The bathroom is the one place you can really escape from it all. This collection of exposed light bulbs is placed in the ideal location in front of a large mirror, meaning that the reflections appear to double the number of bulbs (if you want a really dazzling look, you could also place a second mirror on the wall opposite, meaning the bulbs will be reflected infinitely). The red cords add an extra sharp edge to what is already a very daring look. This is an adorable look that also happens to be highly effective in creating a soft, calm mood. The light from the little crystals that make up these mini chandeliers casts beautiful shadows beneath them, just like with a regular chandelier but on a smaller scale. For added effect you could place items you want to show off underneath the chandeliers for extra illumination, as has been done here with that pretty copper bowl in the foreground. There's a real vintage vibe about this hanging lamp, which uses old-fashioned supports to add a touch of elegance to the classic globe light often found in bathrooms. This lamp is that rare and highly desirable thing, a statement piece that isn't showy. Inlaid ceiling lights are a fixture of modern bathroom design, but their brightness has to be just right in order to make the room work. It's a good idea to supplement your ceiling lights with additional lamps around the bathroom, which can provide mood lighting on occasions when the brightness of the ceiling lights is too much. 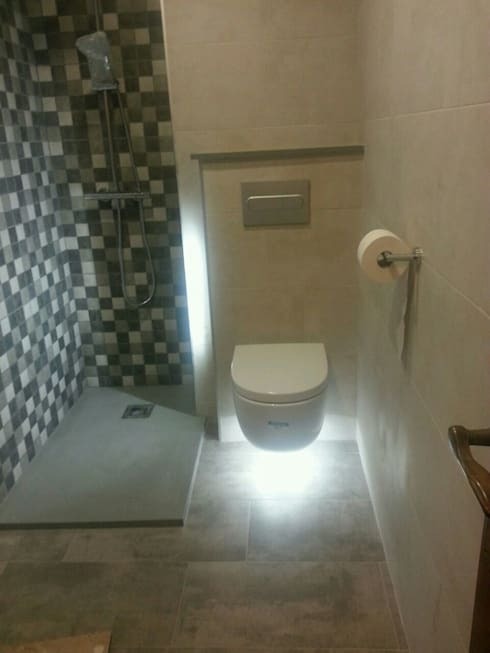 Have you thought about illuminating the edges of your toilet and shower? No? Well, fortunately someone else has - River Cuina design, to be precise. Visit their profile to see more. Using a lampshade with patterns punched into it, such as this example, will cast lovely shadows all around the room. It's like a disco ball (but without the disco). 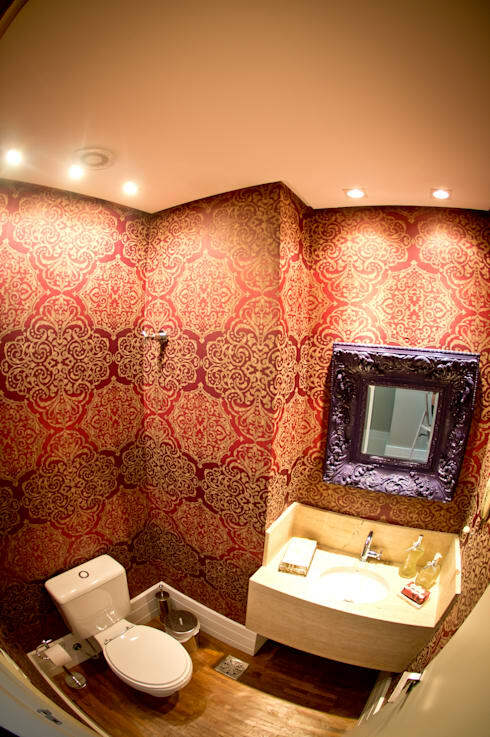 Standard lamps are not used that often in bathrooms, largely because a lot of bathrooms down have a power socket. 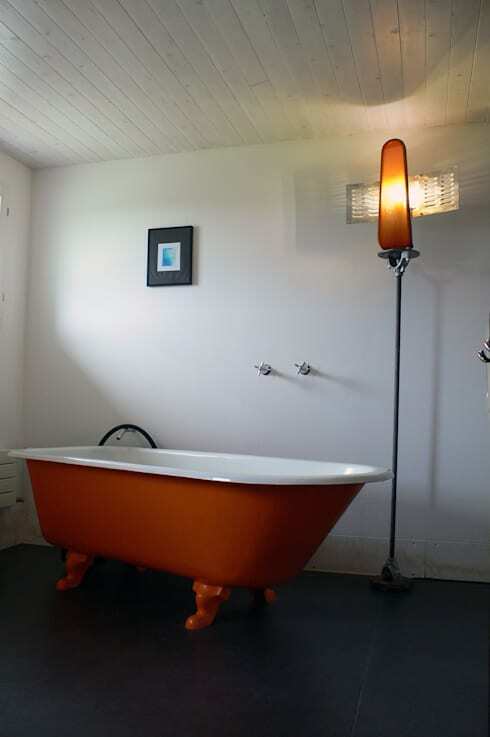 If you have somewhere to plug it in, however, a standard lamp next to the bathtub can provide the perfect atmosphere for a soothing evening dip. Looking for more bathroom inspiration? Take a look at these bold bathrooms and get creative!